Maybe you’ve noticed, maybe you haven’t, but I’ve been away for two weeks this month as I went to Slovenia, my home country, in order to start working on my driving licence. Although I live in the UK I want to pass my driving test in Slovenia as I think it’s easier there, roads are quieter and people don’t seem to drive as crazy as they drive in the UK. What does this have to do with healthy living, you may ask. Well, when I go abroad somewhere I always love to take pictures and show you guys anything that may inspire you in terms of healthy eating, fitness and health. I did fair bit of cooking during those 2 weeks in Slovenia and that’s because I had time. Well, I needed a break from studying for first aid exam really. 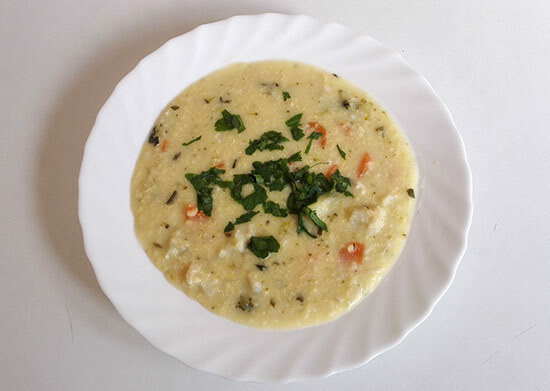 One of the first things I made was Millet and vegetable soup, recipe here. It was very filling and you really don’t need much on the side apart from maybe some side salad. 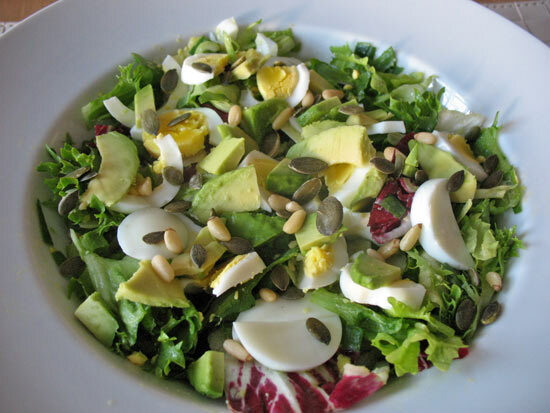 This would make a perfect lunch. Just when I was there, asparagus season started so I bought some Slovenian asparagus and made an asparagus soup with cauliflower which needed to be used. I must admit I was not a big fan of asparagus and cauliflower combination. 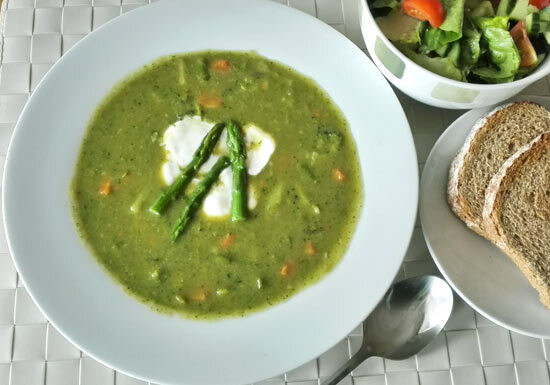 The asparagus soup with broccoli which I made last year tasted much better. Well, at least I experimented and learnt something along way. I didn’t always cook at home and once me and my sister had lunch in a supermarket restaurant. The restaurant is nothing like you will find in the UK. It’s a kind of canteen but different. You take a tray and pick things that you want. There is one section dedicated only to cold salads. This is heaven for me. In the picture above you can see a bowl full of various salads I picked from the buffet. 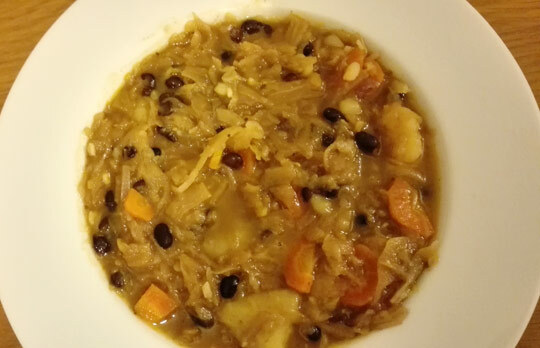 I have also decided to have a soup with it. I think this meal costed less than 6 euros, a really good deal. It’s good to see you can buy Meridian’s nut butters in a supermarket but they are bloody expensive! While browsing one the shops in a small shopping centre I stumbled upon chocolate pasta! Chocolate pasta?! It’s actually pasta with cacao but I say chocolate pasta as it sounds more fancy. Who knew anything like that actually existed? I didn’t find sugar in ingredients list so I believe it’s not sweet. Amazing what you can find in Slovenia, but it shouldn’t come as a surprise as Italy is just next door. 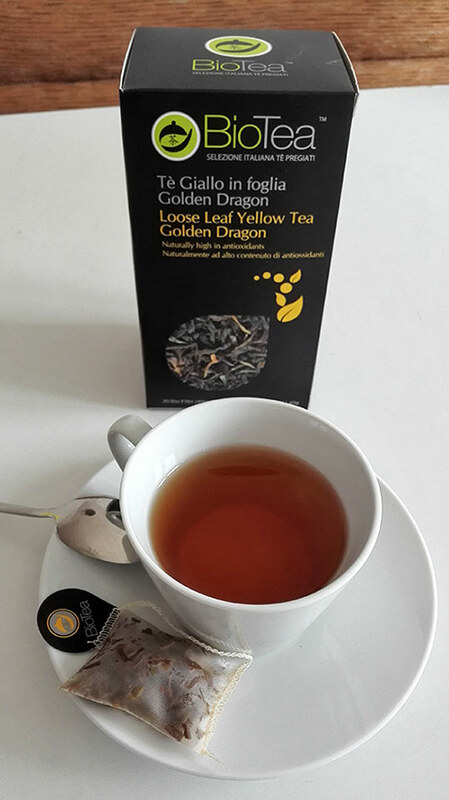 Have you heard of yellow tea before? My sister was given a box of organic yellow tea as a gift and I was lucky to try it out. Read all about it here. Every day I was active – I was either cycling or going for walks. It’s lovely watching animals when you walk there. You will see horses and cows. Outdoor gym with a running path is another big plus there. I only took onboard luggage with me when I came to Slovenia so one of the first days there was spent shopping. I bought Lavera’s deo roll-on (one of my favourites) and Lavera’s shampoo which I haven’t tried before (I wasn’t a big fan after I tried it as it had this jelly like texture). I also bought Weleda’s Skin Food and 100% natural toothpaste. It’s so easy to buy green beauty products in Slovenia. I bought everything what I needed in a small shopping centre. So there you have it, some of the pictures I took while in Slovenia. Although it seems like I had a healthy 2 weeks, of course I also ate some naughty stuff like Slovenian doughnut (totally amazing!) and croissant with apricot jam (the best croissant ever!). I just cannot resist Slovenian sweet treats, they are so nice, and well I am not there every month so it’s ok to have them, right? I am mostly good anyway..
Have you been anywhere lately where you managed to stay quite healthy? It sounds like you had a lovely time 🙂 I love going back to Poland, where I’m from. It’s so different to life in UK… And contrary to what people believe the weather is lovely and warm – summers are much nicer than in UK, with proper thundery storms. PS. Good luck with driving licence! It’s great to hear Poland is also quite warm and sunny,would love to go there one day. Unfortunately UK has one of the highest obesity rates in Europe and it’s definitely noticeable. I hope it doesn’t take me too long before I pass my driving test, thanks Jo!